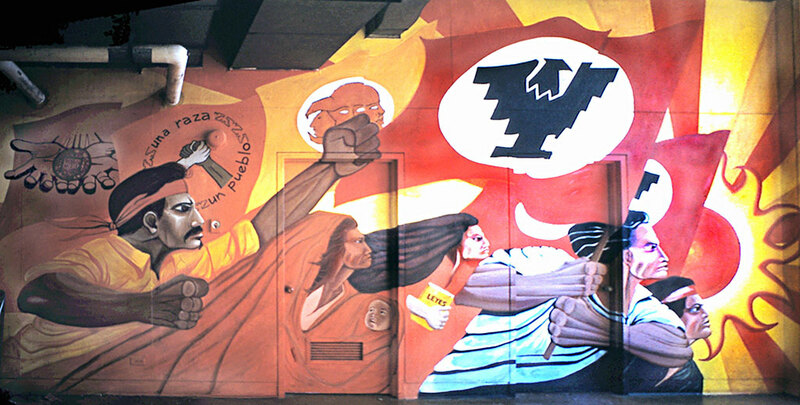 Original mural painted by CASA members on the 5th floor of Wurster Hall. 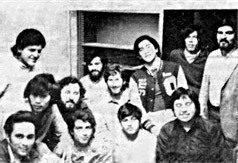 ©1977 C. Rodriguez, O. Lopez, R. Hernandez, M. Delgadillo, C. Escobedo, et al.  Forty-five years ago, on the heels of the 1968 upheavals and against a backdrop of political activism, a handful of Chicano architecture students met in a small room in Wurster Hall to form a new student group. The details are fuzzy regarding that first meeting, but those early members of the Chicanx/Latinx Architecture Student Association, better known as CASA, agree on their original objective — to help each other navigate the rigorous academic challenges of CED and find social relief in their collective cultural experience. 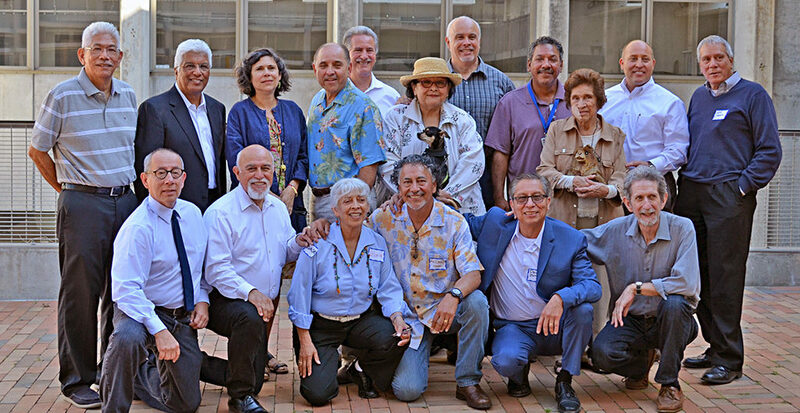 On June 11th 2016, original CASA alumni and friends reunited in Wurster to share memories of those early days and celebrate the community they formed which continues to raise public awareness and provide outreach and support to Latino CED students. 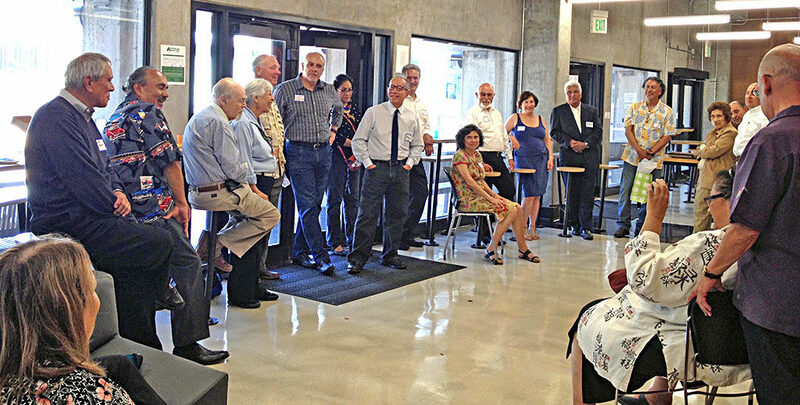 Those gathered included Fred Atilano (B.Arch ’73), Rudy Carrasquilla (M.Arch ’78), Jorge Castillo, Anne Cervantes (M.Arch ’80), Robert Daughters (MCP ’74), Maritza Delgadillo (M.Arch ’78), Dan Esparza, Ernestine “Sunny” Esparza, Roy Hernandez (M.Arch ’78), Charles Higueras (M.Arch ’81), Oswaldo Lopez (M.Arch ’78), Carlos G. Mendoza (B.Arch ’73), Ross Ojeda (M.Arch ’73), Michael Ordonia (M.Arch ’77), Antonio Pizano (M.Arch ’75), Gloria Ramos (M.Arch ’73) — the first Latina to graduate from UC Berkeley with a degree in architecture, Cesario Rodriguez, Thomas B. Sanchez (M.Arch ’79), Victoria Vargas, Carlos Villagran (B.Arch ’73), David Zamora (B.Arch ’73), and Chris Ynzunza. CASA alumni share stories during the June 2016 Alumni Reunion. While community is intrinsic to CASA and to CED — Oswaldo Lopez noted that even in his early days at CED, understanding the role of design as it relates to society and community set CED apart in its approach to teaching — expanding diversity at CED was an ongoing challenge, and remains a vital mission of the college. As students in the early 1970s, with the encouragement of CED faculty including Professors James Prestini and Joseph Esherick, Roy Hernandez and Lopez submitted a proposal to fund a recruitment program for students of color. The new Community Design Outreach Program formalized the organization’s outreach program. Decades later in 2011, Roy, Oswaldo, and others formed the CASA Alumni Association to better assist students with mentoring, preparing applications to graduate school, and providing scholarships and professional guidance. The CASA Scholarship Fund, which supports low-income students of color at CED, symbolizes the continuity of the support community that was born over 40 years ago. 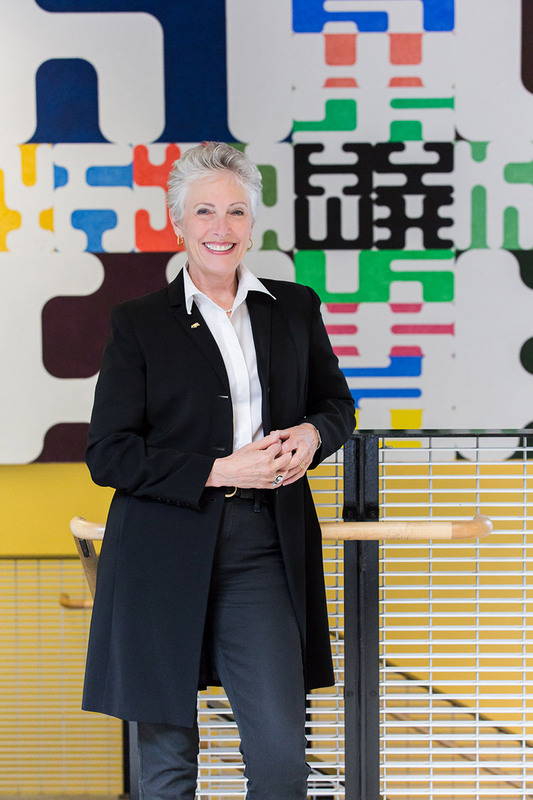 Through a partnership with Latinos in Architecture — a part of AIA — CASA is now able to access 501(c)(3) status, with the hope that this will encourage increased contribution. 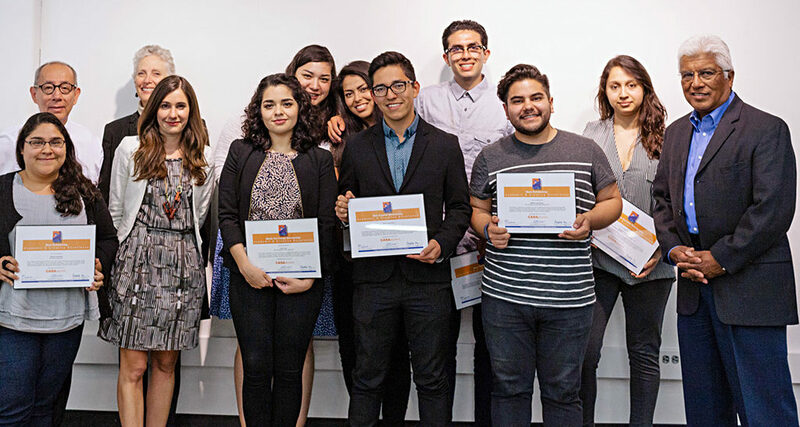 CASA scholarships and prizes are named in honor of former CED professor Martin Del Campo, Antonia Escobar, and the late Bob Esparza (affectionately known as El Oso Mayor), one of the original founders of CASA and a guiding force in the organization’s early days. A special tribute to Esparza was an emotional highlight of the June event. Read more about the history of CASA, its mission and alumni reminiscence. CASA alumni and friends gathered at Wurster Hall to celebrate 45 years of community.